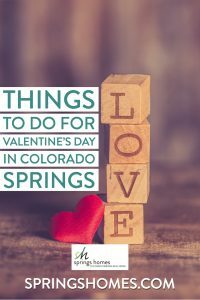 Things to Do for Valentine's Day in Colorado Springs: New for 2019! Updated for 2019! Maybe you’re new to the Pikes Peak region, or maybe you’re just looking for something new this year. We here at Springs Homes wanted to give you some ideas for you and your significant other… your kids… or just for yourself this Valentine season! For any of these, we highly recommend making those reservations soon!